Korean Air’s first class: And Heather Cho flipped out on nuts? Since last September I’ve flown from Paris to Seoul to Shanghai and back on Korean Air, spending some hard-earned points to travel in first class. In between, airline senior VP of inflight service Heather Cho Hyun-ah physically assaulted a cabin crewmember in December, for which she was later jailed. She is now appealing her sentence from prison. Premium passengers expect premium airport processing. Unfortunately, that was present at zero out of four flights I took on Korean Air. Whether at Paris, Shanghai or either Seoul Gimpo or Incheon, the first class airport service was almost entirely lacking. The only difference between business class was a deeply unimpressive first class lounge at Incheon, with scant lukewarm food that had been picked over, no Champagne, $7 wine, chairs in serried ranks that felt like they’d fallen off the back of a corporate seating truck in the 1990s, and furniture that was more bashed about than an Air Canada flight after a “hard landing”. A budget hotel would have been ashamed. At Incheon — which after a few transits has me thinking it’s the most overrated airport in the world unless you want to buy multiple kinds of facial whitening cream — there is no premium passenger processing, so fifteen-deep queues for ID check, X-ray, and passport control were the order of the day. It’s difficult to see any hub in the major leagues considering this as an acceptable provision. With priority first class boarding offered only at Incheon (all three other airports were a mix of an A380’s or 777’s worth of business class passengers and second-tier frequent flyer cardholders and above), the line for boarding was long and not given priority over economy, which was processed at the same time. Korean Air’s A380 fleet date from between 2011 and 2014. Mine, MSN39 HL7612, was the airline’s second, dated back to 2011, and didn’t look like a single piece of hard product maintenance had been done on it. The seat was shabby and worn, with mechanisms non-functional — the privacy shell around my seat refused to raise and lower without manual encouragement, and I watched on my final flight as several of the seats refused to display the safety-compliant green light before takeoff from ICN. And the airline’s decision to provide only one lavatory for first class passengers (only slightly larger than a normal economy lavatory), while taking up space with a needless self-service bar of Absolut-branded room temperature beverages, was truly baffling. 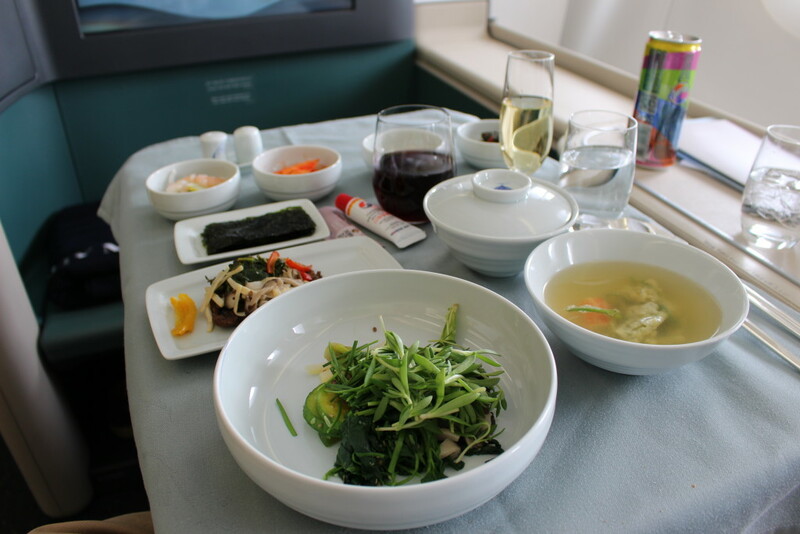 Korean Air serves delicious meals, well-considered and well-presented, with quite elegant Wedgwood china and Schott glassware. On my flight to Paris, I selected the western terrine starter and the bibimbap as part of the Hansik Jeongchan menu and was simply delighted by every single mouthful. The problem with it, though, is in the details around the service. Wine glasses were presented in the wrong order (I’d asked for the red with the beef-based main course and the Sauternes with the terrine) and stood empty for longer than I’d expect being the only person in first class. An espresso based coffee menu was presented, promising a choice of latte, cappuccino or macchiato, but the milk part of the machine was broken. Ignoring the fact that part of the galley was unserviceable on a flight from the airline’s main engineering hub, why not just remove the coffee menu and present an option of an espresso or Americano as surprise-and-delight? The tea was no better, with a nameless bagged green tea and the only black tea on offer the awful Lipton that makes a horrible brew at ground level, let alone at altitude where the water isn’t hot enough. To add insult to injury, Korean Air will sell you from its duty free catalogue the TWG teas served by other airlines in business class. It’s simply baffling that the airline is skimping on a non-perishable, lightweight product like tea. Korean Air’s wine list on this flight was both scant for international first class — two reds, two whites, a dessert wine, a port and a Champagne — and absolutely bizarre, as if it had been put together by several different people without a thought to coherence or suitability for drinking at altitude. Price isn’t the be-all and end-all of inflight wine — there are many relatively inexpensive wines that do exceedingly well at altitude — but if selecting old world wines (and particularly when all French apart from the port) price does make a difference. The very middle of the road minerally Chablis is the 2011 Vaucopins from Albert Bichot. Not only is this wine inexpensive for first class, at $25 retail (and only a premier cru — I think first class passengers could reasonably expect a grand cru), but it’s quite unsuitable to the air: the flinty, steely notes characteristic of the terroir lend themselves very poorly to drinking in a dry cabin at the equivalent of 6-8000 feet. Korean Air also forked out $60 for a 2006 Lascombes Margaux that was watery and flavourless. I’ve had better $20 bottles of Aussie or Kiwi Bordeaux blends that are reliably better at altitude, with more fruit and complexity that is actually detectable. A $14 sweet Gewürztraminer (deeply sickly, and I say that as someone who is an enormous fan of aromatics and off-dry wines) and a $14 mushroomy Pinot Noir (nothing but tannins) plus a $20 bottle of Sauternes (served at room temperature and really only matching well with the paté), together with a $10 bottle of cheap Sandeman’s tawny port, rounded out the menu. 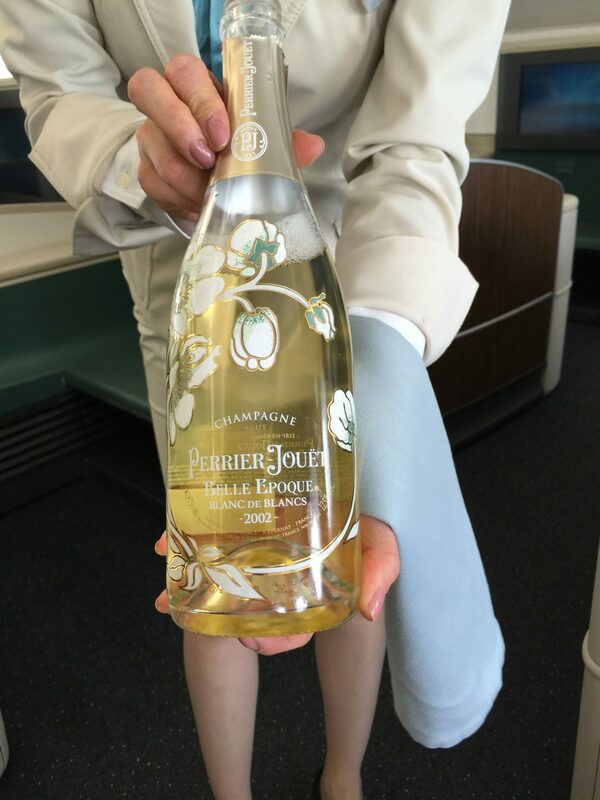 While the Champagne — a light and outrageously expensive $250 Perrier-Jouët Belle Époque blanc de blancs 2002, served exclusively on JFK and Paris flights — was delicious, it’s excessive and lost its elegance at altitude, especially when the crew failed to chill it. 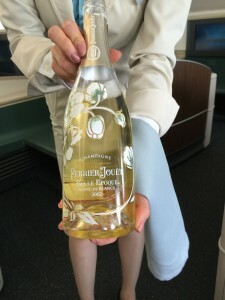 Moreover, this is more expensive than Krug or Dom Pérignon or any other inflight Champagne except JAL’s Salon. The price tag could have been much better put towards a $100 bottle of the regular Belle Époque (served on other intercontinental routes, and quite decent for first class) and boosting the quality of the rest of the wine list that was barely better than two buck chuck. 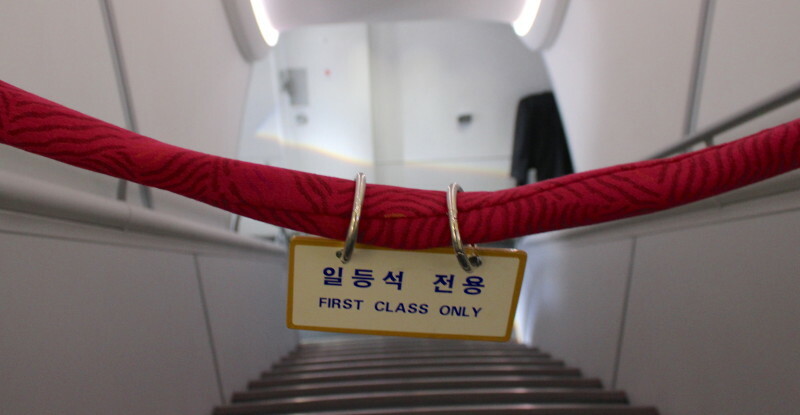 Korean doesn’t serve any Champagne at all on its first class flights within east Asia, leaving connecting passengers in first class with only a sub-section of the rest of the wine list. 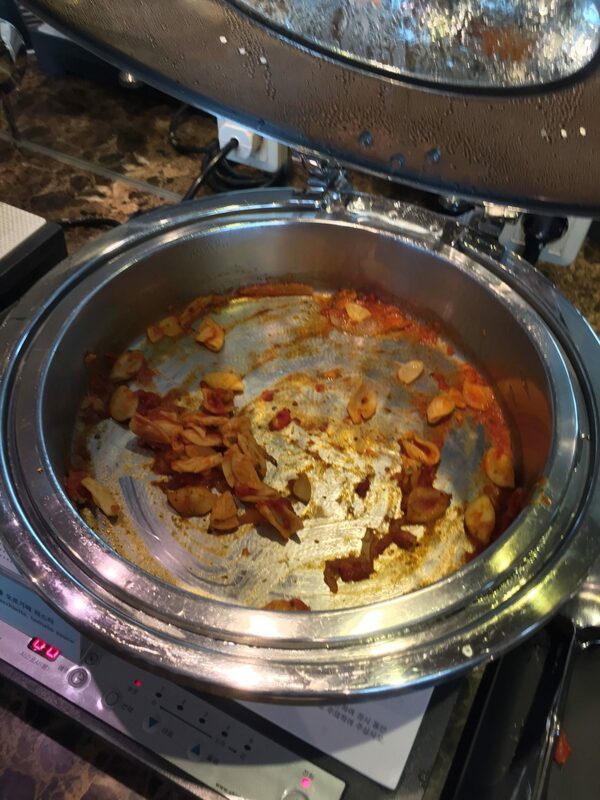 A little lounge pasta, anyone? Overall: the airline needs to significantly up its game. Whither Heather Cho? The four largest problems with Korean Air’s service shouldn’t take away from the smaller ones — thin “mattress” mats that are put to shame by other airlines’ business class, a paltry selection of inflight entertainment without any notable customisation, no inflight connectivity for one of the world’s most connected nations, very minimal between-meal snacks on a 12 hour flight, no mobile check-in app, no arrivals lounges, questionably intelligible English, no spoken French announcements on Paris flights… and, in a move that was quite telling given the international focus on the way the airline serves its macadamia nuts, the nuts on my final flight were presented in a bowl without being presented in a bag first. 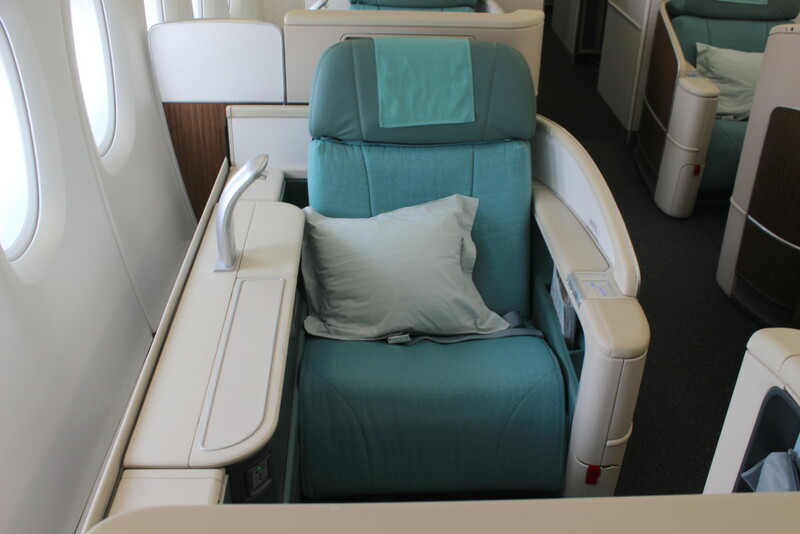 Here’s the thing: if Korean Air wants to be taken seriously in first class, and its installation of a regional first version of the new B/E Aerospace Apex seats it is spreading across its fleet suggests that it does, it needs someone who isn’t afraid to highlight where the problems lie. A person with the drive and dedication to create a world-class premium product is desperately needed at Korean Air.